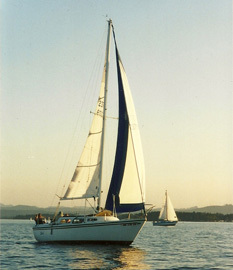 Used sailboats for sale at Under Way LLC located in Eugene, Oregon. Buy from one of the west coast's best and largest selection at great prices. Specializing in trailerable sailboats ranging from 18 ft., 20 ft., and 25 ft. up to 32 ft. including racing, cruising, small and project sailboats. We have complete service, repair, parts and trailers available. Browse some of our inventory online or contact Scott at (541)463-0555, for additional models not shown. No trailer, good condition, no sails. A great, inexpensive boat.